Our contact lens specialists at Zacks London Eye Clinic in central London W1 fit soft contact lenses from several different suppliers so that we can prescribe the most appropriate solution for your lifestyle. Soft contact lenses are manufactured from plastics which absorb water into their structure making them feel soft and flexible. Soft contact lenses are usually comfortable straight away and are ideal for occasional wear. They are unlikely to dislodge from the eye making them suitable for sports or use in dusty conditions. Disposable soft contact lenses are replaced on a daily, weekly, fortnightly or monthly basis. Increasing the replacement frequency reduces the risks of discomfort, allergies and infections. Tailor made soft lenses are available for patients with high prescriptions that fall outside disposable ranges. These can be supplied on a frequent replacement basis. We fit cosmetic and prosthetic contact lenses for film and TV productions as well as to help patients hide disfiguring eye conditions and for those who simply want to change the colour of their eyes. Super permeable soft disposable lenses can be worn for several days or weeks continuously. They are beneficial for patients who have handling difficulties. Soft Toric contact lenses correcting moderate levels of astigmatism are available in disposable ranges, Higher astigmatic prescriptions can be corrected with tailor made soft toric lenses. 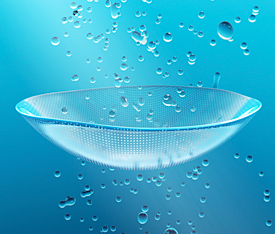 Multifocal soft contact lenses are available in disposable and tailor made ranges. They can provide good vision at all distances in the early stages of presbyopia. In the early stages of keratoconus, soft contact lenses can provide good visual correction. Chromagen soft contact lens tints can be used to enhance colour perception and colour discrimination for people who are ‘colour blind‘ or to help with dyslexia. For more information on Soft contact lenses or to find out if they are suitable for your eyes, please get in touch to make an appointment for a consultation at our London practice.